My constant companion Ace, peeking through the fence as I practice the Zen of chopping wood. I was married once. When I was 19 years old. It was something people did back in the “Good Ol’ Days”. But, it turns out they weren’t really that good, nor was the marriage. Neither lasted. Most of my memories of that time are gone, erased either by decades of time … or perhaps choice. Now, decades later living in my exile in my small cottage (The Alamo) on the North Coast of America in Fair Haven, I get this experience almost every cold winter’s day. And, these days have been particularly cold -- in more ways than one. I have just recently learned that my (and Ruth’s) daughter has cancer. The big “C”. My heart froze at the word as it brought back the haunting of the seven years of operations and chemotherapy I went through by my Mother’s side until it killed her at 62. This version of “C” is in the early stages and I’m told to “relax” as it won’t be as bad. So now, chopping wood can become an almost religious experience. A chance for contemplation in the silence of the North Coast. I order wood by the truckload, and have to chop a certain amount of it for kindling to start fires in my ancient black cast iron wood stove. By modern technology standards it’s not efficient by any means. Even the handle that turns on the “secondary burn” is rust-frozen shut. But burning wood is cheaper than heating with propane – especially if it’s above 20 degrees. But not only that, it smells better. It looks better. It tastes better. It sounds better and generally feels better. There’s a certain skill it takes to chopping wood without cutting your leg off, or breaking your back. I’ve now honed my chopping skills so that I can do it without thinking about it. 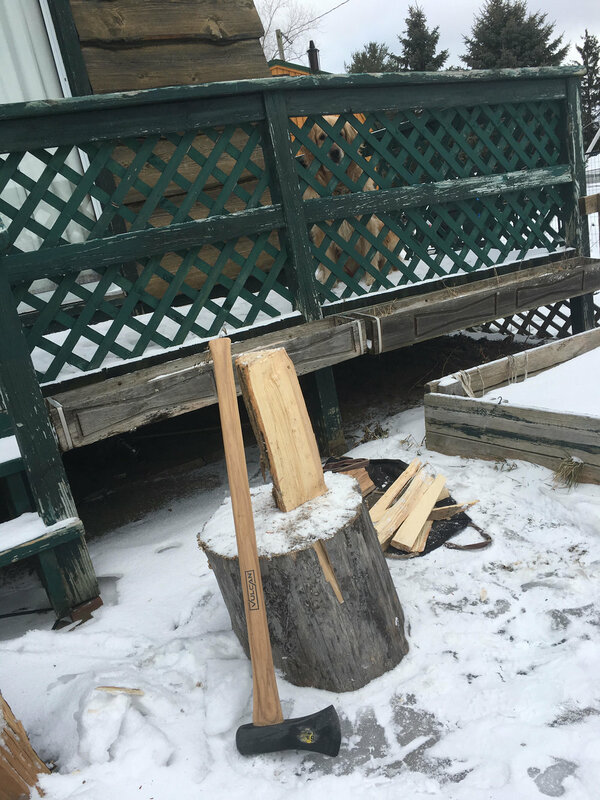 I’ve tried everything from a short handled sledge and a five pound splitting wedge, to flailing at the logs with a Hudson Bay axe. But, My weapon of choice is a 6 pound Vulcan maul I got from Wilson’s Hardware on Monroe Avenue In Rochester. I mention them because when I bought the first one of these, the handle broke the first week I had it. A year later (that’s right … a YEAR later) I finally got around to taking it back. I didn’t expect them to believe me, but I told them how it shattered. Without missing a beat, the guy behind the counter said, “Well, that’s no good.” Then, he walked over, took another one off the display, handed it to me and said, “Sorry, give this one a try”. No receipt. No charge. No hassle. Wow. Try getting that service from Amazon. I think it’s part of the Karma that comes from chopping your own wood. It turns out that doing my daily chopping not only warms me twice, but gives me a chance to clear my mind and take stock of the truly important as opposed to the apparently important. For example, if I don’t have enough kindling, I can’t start a fire and it will get deadly cold inside. That’s REALLY important. Besides that though, there are the nights. Sitting in front of the fire, reading a book, sipping a little snifter of Irish whiskey before turning with my trusted dog companions by my side, makes the long winter here shorter, exile bearable, my heart warmer. Winter on the North Coast is not for the feint of heart. Fair Haven is located around Little Sodus Bay on Lake Ontario. It’s flanked east and west by drumlins and to the south is a ridge that, in my meager meteorological skilled mind, can make weather forecasting virtually impossible. Four miles up the road on the other side of the ridge in the Village of Red Creek, the sun can be shining, while here on the North Coast we are battling a blizzard that makes the wildest blizzard of the “Good Ol’ Days” look like a day at the beach. But the reverse is true as well. NY Route 104 can be a white-out nightmare, while we’re basking in a the glare of winter sunshine. Like today, when I’m writing this and the ice fisherman are dotting the bay like so many colored ant-hills. And the other thing that’s true is that no matter what, it’s beautiful. If you know anything about me, (and I’m guessing if you’re reading this you are at the very least a “Facebook Friend”) you know that these last few years have not been exactly wonderful. Lots of personal battles. Relationship disintegration. Work challenges. Financial mountains. Questions about my legacy and life’s worth. But now, contemplating my daughter’s cancer while chopping wood, I am coming to a better understanding of what it’s all about. A lot of things I’ve worried about just don’t really matter. And, here’s something that does. Seems like just yesterday, she was holding my hand as we toddled through the woods along the winding creek in back of the house that I grew up in. Now, a Mother in her own right, she’s got battles of her own to fight. And, they’re bigger than mine. Now, when I chop wood, I think of her and what I’ve learned about living. Write and sail more. Worry less. Love more. Be nice to people. Spend time chopping your own wood.